Tuesday, Oct. 31, is Reformation Day, the 500th anniversary of the beginning of the Protestant Reformation. Martin Luther, a Roman Catholic priest, wanted a public debate on the Church's practice of selling indulgences. As was customary, he nailed a document to his church's door in Wittenberg, Germany, to create interest. His Ninety-five Theses — numbered statements that built his argument — changed the world of his day and ours. "Sola Scriptura: We reaffirm the inerrant Scripture to be the sole source of written divine revelation, which alone can bind the conscience. The Bible alone teaches all that is necessary for our salvation from sin and is the standard by which all Christian behavior must be measured. We deny that any creed, council or individual may bind a Christian's conscience, that the Holy Spirit speaks independently of or contrary to what is set forth in the Bible, or that personal spiritual experience can ever be a vehicle of revelation." To further our understanding of the Doctrine of Sola Scripture — defended by Martin Luther — the following excerpts are from the Preface of The Chicago Statement on Biblical Inerrancy, 1978, also from ACE. 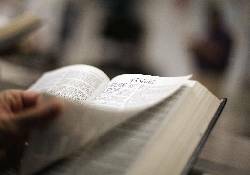 "The authority of Scripture is a key issue for the Christian Church in this and every age. Those who profess faith in Jesus Christ as Lord and Savior are called to show the reality of their discipleship by humbly and faithfully obeying God's written Word. To stray from Scripture in faith or conduct is disloyalty to our Master. Recognition of the total truth and trustworthiness of Holy Scripture is essential to a full grasp and adequate confession of its authority." The Preface goes on to state: "We offer this Statement in a spirit, not of contention, but of humility and love "
The Reformation Doctrine of Sola Scriptura still stands as foundational in Protestant Christian faith and practice. Adherence to Sola Scriptura underscores relevant biblical teaching, helps one avoid error in living a godly life and amplifies our understanding of the Protestant Reformation initiated by Martin Luther 500 years ago.